But it “wouldn’t be a walk in the park” either. THERESA MAY HAS said that a no-deal Brexit “wouldn’t be a walk in the park” but “wouldn’t be the end of the world”. The British Prime Minister is seeking to downplay a warning made by Chancellor of the Exchequer Philip Hammond last week that such a scenario would cost £80 billion (€88 billion) in extra borrowing and have a negative impact on long-term economic growth. 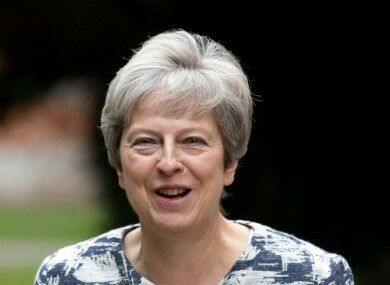 The Guardian reports that, speaking to reporters as she began a three-day trip to Africa, May cited remarks about Brexit made last week by Roberto Azevêdo, the director general of the World Trade Organisation, when making her comments. “Look at what the director general of the World Trade Organisation has said. He has said about the no-deal situation that it will not be a walk in the park, but it wouldn’t be the end of the world. “What the government is doing is putting in place the preparation such that if we are in that situation, we can make a success of it, just as we can make a success of a good deal,” May said. Last week Brexit Secretary Dominic Raab said Britain and the EU have reached agreements on about 80% of issues relating to Britain leaving the EU. However, the Irish border issue remains unresolved. On Saturday, Tánaiste and Foreign Affairs Minister Simon Coveney sharply criticised pro-Brexit Tory MP Jacob Rees-Mogg who claimed that the border could be subject to inspections “just like during the Troubles”. Email “May says no-deal Brexit 'wouldn’t be the end of the world'”. Feedback on “May says no-deal Brexit 'wouldn’t be the end of the world'”.